I’m not quite sure what got into me with this one. I can’t say I regularly sit around and think about making custom beeswax birthday candles, but for some reason this idea just popped into my head. You know when you go online to look up how to spell a word and all of a sudden it’s 20 minutes later and your sifting through search results pinning pictures of vintage refrigerators? Am I the only one this happens to? These candles came about in just that way. I blinked, looked up, and all of a sudden I had beeswax pellets and cotton candle wicks in my shopping cart. I learned a thing or two about candle making while venturing down that Pinterest rabbit hole. 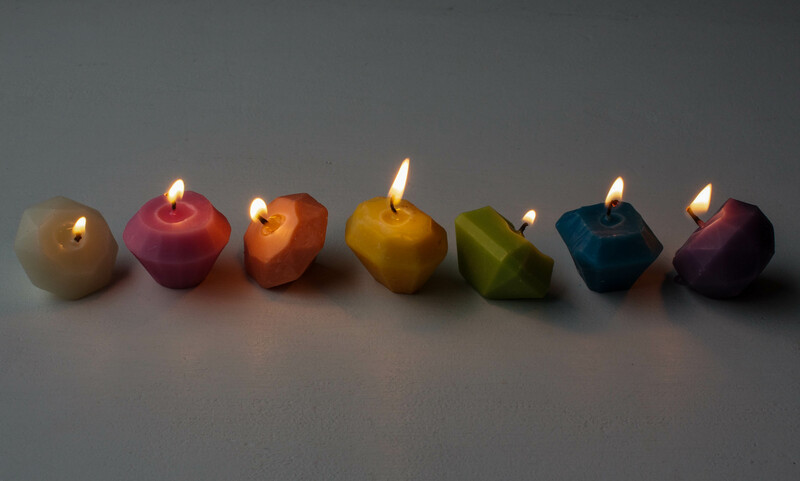 For instance, there are three main waxes that candles are made of: paraffin, soy, and beeswax. 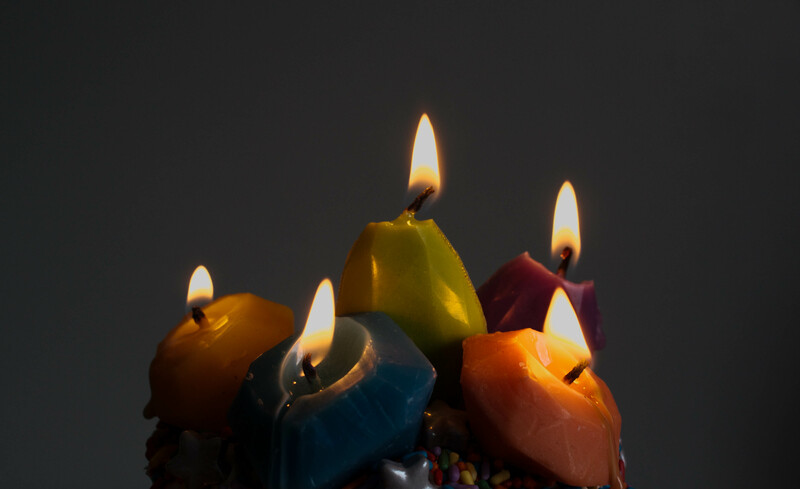 From what I could gather most birthday candles are made of paraffin wax. It also appeared that paraffin seems to be the least favorable in terms of health and safety. 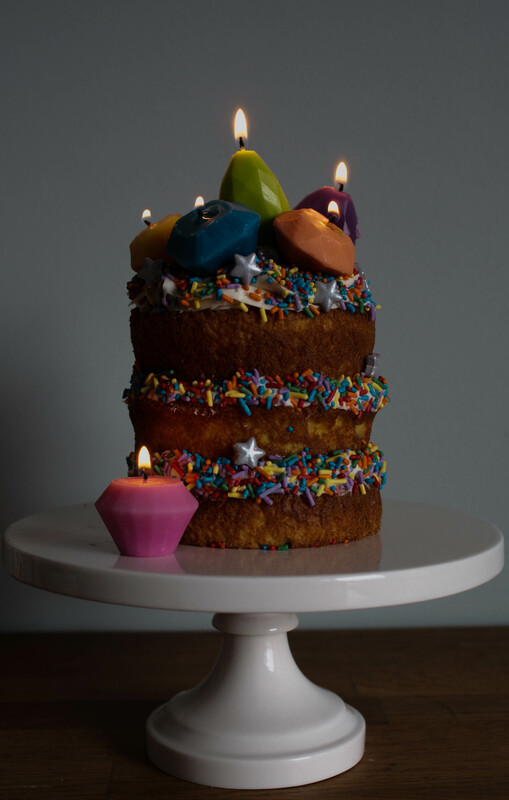 Not that 30 seconds on a birthday cake is going to make or break anyone, but still, if it’s going on my food or my kids’ food, I want to know it’s the safest thing I can use. Beeswax seemed to be the safest wax to use, while also smelling great and having a nice, long burn time. I also learned that not all wicks are created equal. I ended up choosing to use lead-free braided cotton candle wick. Seemed to be the safest while also being easy to find and inexpensive. Once I had decided on the beeswax and cotton candle wicks, I did a little research on coloring my candles. People use all sorts of things – spices, herbs, grated crayons, mineral based colors, oil based colors, and even food coloring. I tried tinting my first round of melted beeswax with gel food coloring, but had no luck. It remained in little clumps and never dissipated. I’m thinking I may have had better luck with an oil based candy color, but didn’t have any on hand. What I ended up using instead was petal dusts. Petal Dust is powdered food coloring that cake decorators use to add color to gum paste flowers, create edible paint, etc. Some candle makers were using non-toxic mineral based cosmetic grade powdered coloring to tint their wax. Seemed a lot like petal dust to me, so I gave it a whirl and it worked like a charm! After pouring my first candle, I was totally hooked! 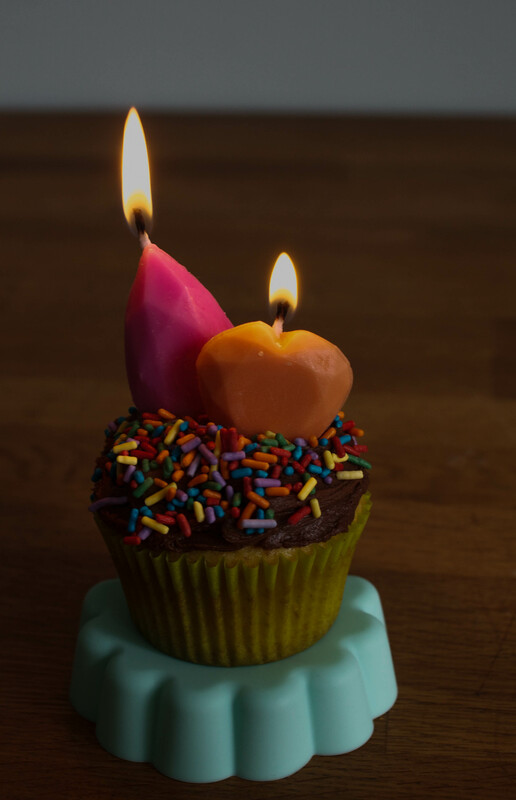 I can’t imagine I’ll buy another birthday candle again. I’m totally serious! It’s that easy. From my years of cake decorating I’ve got bins and bins of hard plastic and silicon molds that will now have a second life making candles. Pour about 1/8-cup of beeswax pellets into the glass measuring cup. Microwave until melted. I used the standard setting on my microwave and it took about 3 minutes. 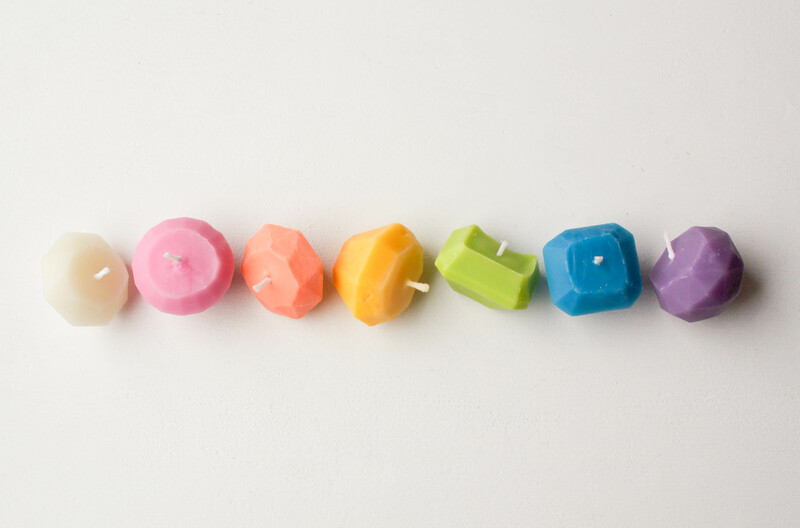 Cut 1-inch pieces of candle wick and carefully dip them into the hot wax. Smooth the wick straight between your fingertips while the wax is still warm and pliable. Set the primed wicks aside. 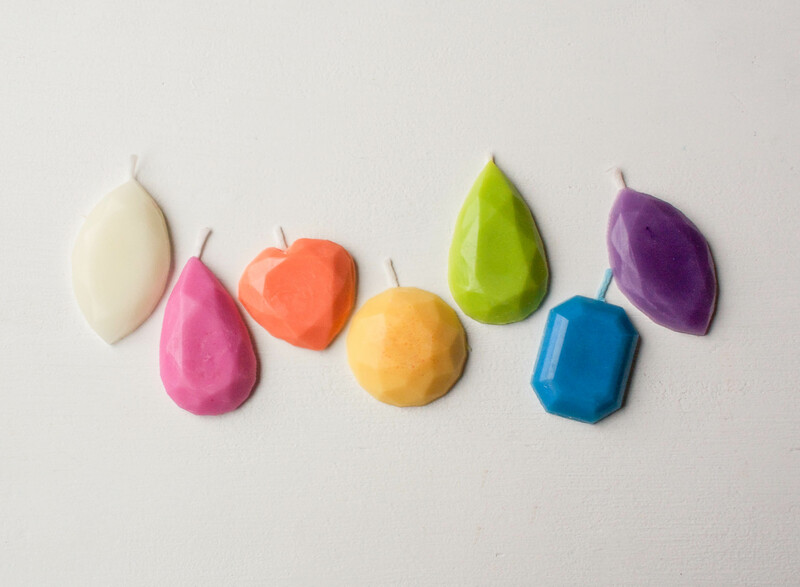 Color your wax by adding about an 1/8-teaspoon of petal dust. The amount that you add is really up to you and how saturated you’d like the color to be. I found that was the perfect amount to achieve the creamy, pastel colors I was looking for. Stir with a heatproof spatula until the color is thoroughly combined. 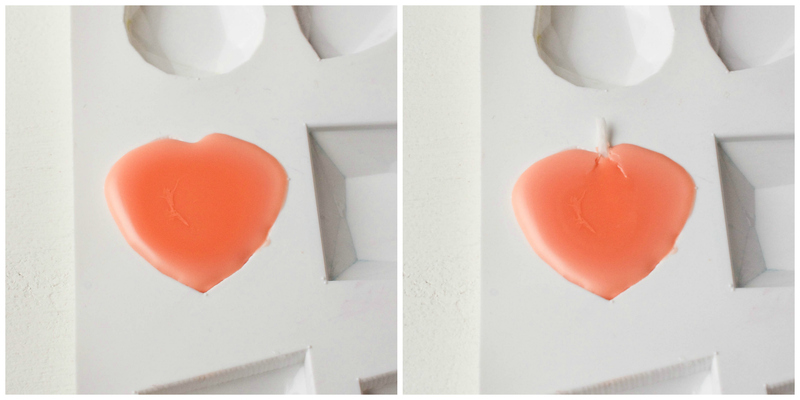 Be sure to add the color while the wax is still very hot, so that it completely dissolves. 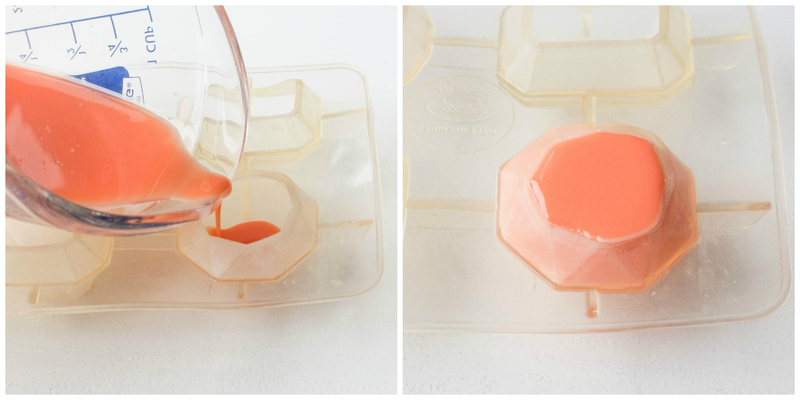 Pour the colored beeswax into your molds. 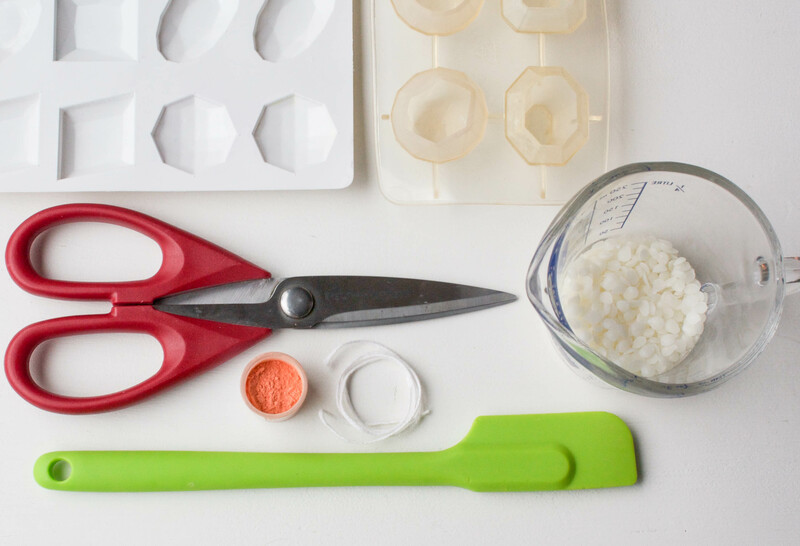 Fill the molds to the tippy tippy top. The wax will contract a bit as it cools. Add the wicks to the flat gems right away. They’re thin and will set very fast. Add the wick to the 3D gem when you see the sides have solidified, but the center is still liquid. It should be thick enough at this point to hold the wick in place. If you have patience, then you can let your candles set up at room temp. If you’re like me and don’t, pop them into the fridge! The flat ones set up very quickly for me, about 10 minutes. The 3D gems took about twice as long. 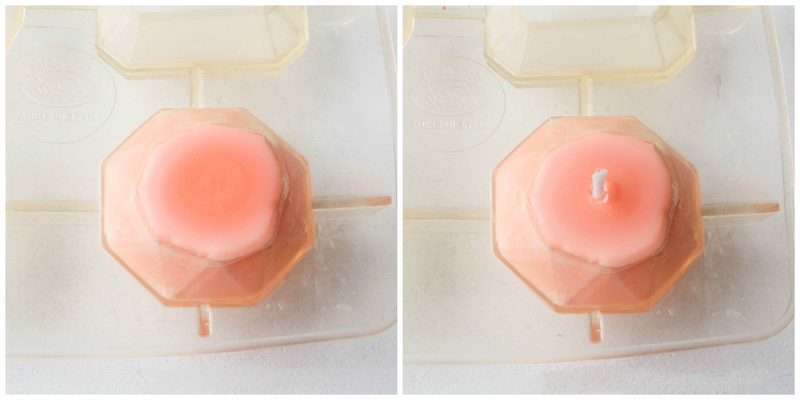 After removing the candles from their molds, trim away any excess wax with a sharp knife. If it’s a tiny amount you can also just use your finger tip to smooth it down. If today is candle making day, then today is not the day to wear silk, cashmere, or any other fabric that you might have strong feelings for. Wear an apron, smock, a beat up t-shirt that you don’t care about. Basically anything that you wouldn’t mind boiling (yes, boiling) or staining. 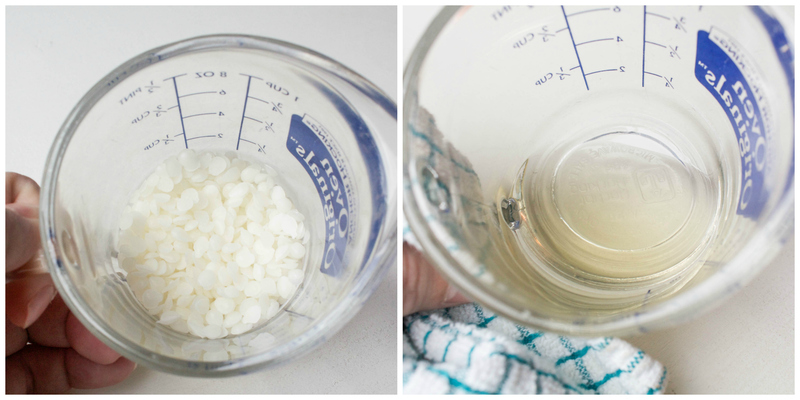 You can find info on removing candle wax from fabric here and here. Although, I found good old fashioned piping hot water worked the best. I got candle wax on my sweatpants and t-shirt (of course). For my pants, I dipped the wax stain into boiling water and swished it around a little, then blotted away the wax residue with a paper towel. My shirt was in much worse shape and required a full dip. I blame the bump for obstructing my view. 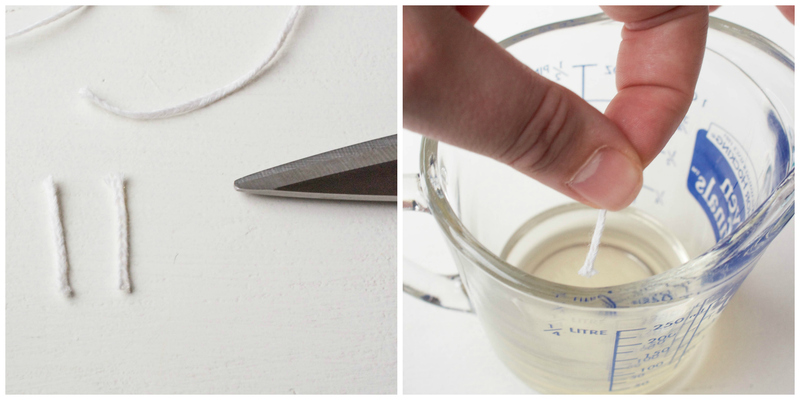 Dip your tools in boiling water to remove any leftover wax. Use tongs to remove them from the water, place them onto a dishtowel, and wipe them down with paper towels while they’re still hot to prevent a waxy film from forming. Dump the hot water when you’re done and wipe out the inside of the pot while it’s still hot. Be smarter than me and work on newspapers or a piece of cardboard. Click here for removal tips if you get wax onto your countertop or floors.